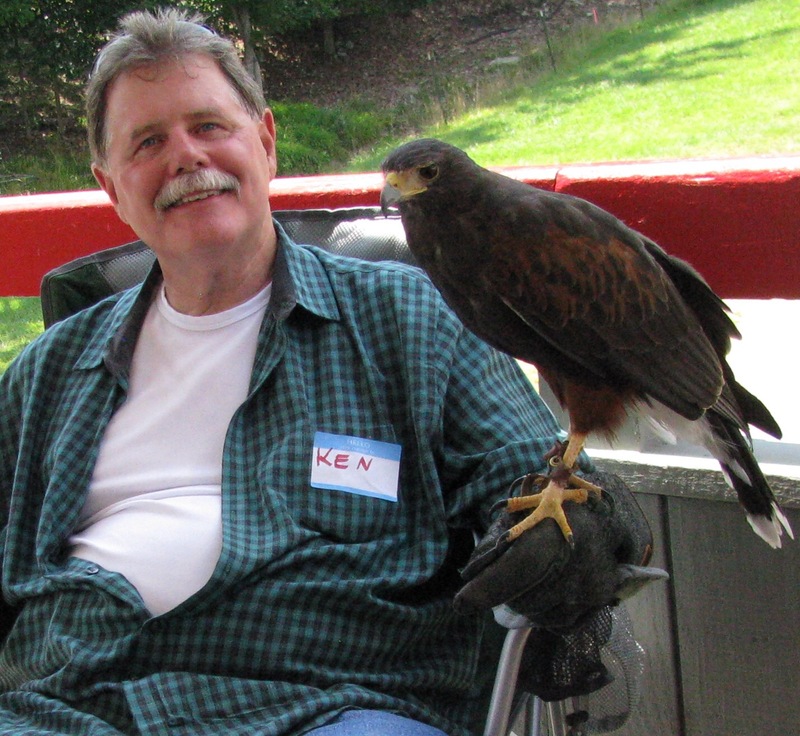 It was so fun to see falconers new and old at the VA Falconers’ Assn picnic yesterday. We saw Brian who came up from South Carolina, and the great news is that he’s moving back to VA. Lud and Lisa were there, Tony and Tony Jr. were there, Bill and Claire, and Kent — all of whom I’ve not seen for at least a year, and some I haven’t seen in far longer than that. 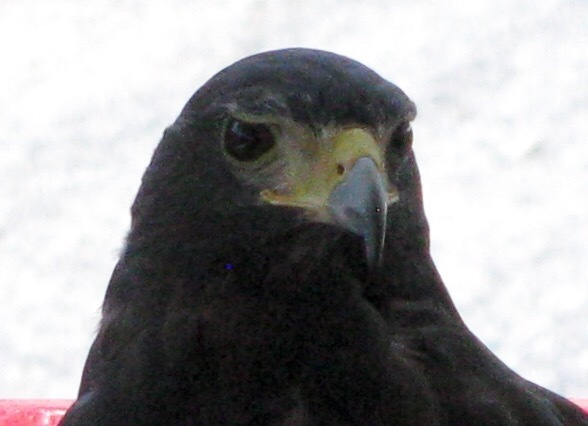 On the “new” side, all of my 3 apprentices showed up, and there were so many curious nonfalconer but “interested enough in knowing more” guests that we held a brief “Hawk Talk” to help inform them about how to get started, and to answer some of their questions. While we often hold “Hawk Talks” at our Open Field Meets, doing one yesterday was a first for the picnic. My longtime friends, Julia and Pam, came to the picnic to see us and we haven’t seen them for a very long time. It was excellent fun to catch up, although I had official duties to perform for the business meeting portion of the event, so I had less time to play with good friends than I’d expected. We had begun our bylaw-permitted election process to get licensed falconer/member input on nominations for the Association president back in June, and so I was pleased to make the announcement yesterday that Andrew was elected by acclimation to succeed me as president of the VFA. Jack and I had also arranged to meet a total stranger, whom we’d “conversed with” only virtually, from our online group of Alto trailer enthusiasts. Scott and his family are Alto “wanna-bees” as they are doing their research on teardrop trailer options, and haven’t decided yet what type will suit their needs the best. They were there as we drove up, and so Jack was able to show them the roof opening procedure while I started doing my presidential best to greet friends old and new. I didn’t see Jack again until lunch was almost over and all the forks were gone. It was a good venue for our event, and Ken and Jen did a great job of making all the arrangements for the event. Last I’d heard, they had 40 reservations for lunch, and I spoke to at least 10 additional folks who had either eaten en route or brought their own instead of participating in the catered meal — so it was a very big turn-out at Massanutten. The only drawback was that there were few places to perch the birds that were brought along, so they’d be accessible to both handlers and guests. I saw three or four birds only, and every time I saw them, they were perched on their falconers’ fists. And it was hotter all day than I’d expected, being at a ski lodge. But I guess we weren’t all that high up the mountain. In the shade it was okay, but it was better to be inside the air conditioned “nature center” where we held our fundraising auction. Gene did a fantastic job as our auctioneer, and kept the audience laughing and spending their money. There was some great stuff on the table and I think the Association made a goodly amount of $ to offset annual expenses. Overall it was a great event and I’m so glad we were able to go. After things wound down, Jack and I took Roomba to Shenandoah River State Park near Luray, VA. En route, we took a quick grocery stop for provisions and dinner, and still found a very nice spot (#20) at 6:30 on a Saturday, with a tad of afternoon shade. Since we didn’t have to unhitch, we quickly set up without having to do very much leveling at all. We turned on the air conditioning because outside it was 88 degrees. 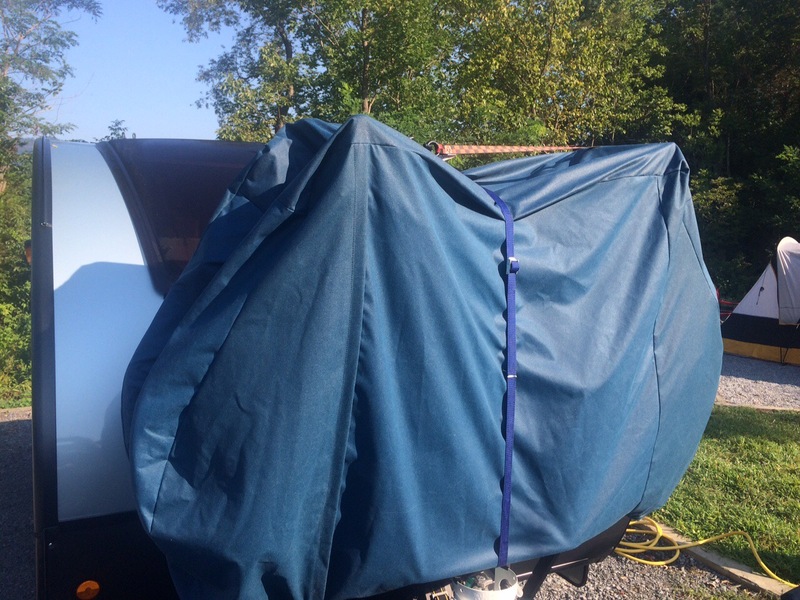 Friday night, before we left for the picnic, we’d picked up the bike cover we’d commissioned our local yurt business to make for our bikes while mounted on the Roomba. Early Saturday, we’d had to remove it as there was too much “flap” in the material, and the Velcro had let loose. So one of the things we did before settling down for a chicken salad dinner Saturday night was to re-attach the cover, and with a couple of packing straps, we secured it better for tomorrow’s drive (we hope). Tomorrow, we’re on to World’s End State Park in PA. Thank you for your report on the Bash and your years of excellent service as the VFA President.